Ireland has 20 native species of bumblebee, but like most things some are rare or have restricted ranges and are not commonly seen. The most commonly encountered species are Bombus lucorum, Bombus terrestris, Bombus Pascuorum, Bombus Hortorum and Bombus Jonellus. Depending on your location you may also see Bombus Muscorum. Bombus lapidarius is more common in the south of the country (I only generally seem to record it on speices rich grassland near the coast in the North) and is listed as vulnerable in the Irish bee Red List. Bumblebee identification can seem daunting to begin with, but like most things it gets easier with time. Thankfully you can take a systematic approach to their identification. This will generally start with tail colour, moving on to the number of bands on the thorax or abdomen. This week we will be looking at the Buff-tailed Bumblebee (Bombus terrestris). In Ireland buff-tailed queens are quite noticeable creatures. They are large species and often one of the first to emerge in the spring, in fact they are one of the few species to actually forage during the winter. It is well worth keeping an eye out for these beautiful bumblebees on mild winter days (especially in urban areas). A few days into January of this year I was amazed to see a lovely new buff-tailed queen feeding on Ivy (Hedera helix). A few days later, I started to notice a few more searching for suitable feeding areas. As I mentioned, the first thing to look for is tail colour, buff-tailed queens have a “buff” coloured tail. This can range from a dirty white to an almost brown/orange colour and stands out quite a bit compared to the white-tailed bumblebee (Bombus lucorum) (which has a very clean white tail, but there’ll be more about that in the coming week). The species has two dark yellow/orange bands, one on the thorax and one on the abdomen (this also differs from the white tailed which has very bright lemon yellow bands on the thorax and abdomen). The queens are rather easy to tell apart once they have been observed a few times (it helps if you have a white-tailed bumblebee for comparison near the beginning though). Unfortunately the workers are not as easy to tell apart as the queens, in fact it’s a great deal more complicated as it involves DNA analysis of the species. 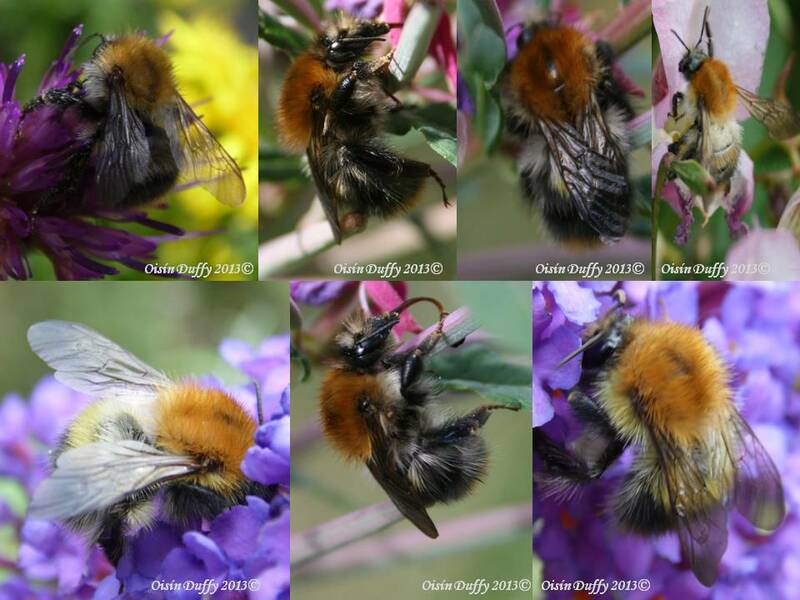 Ireland has 20 native species of bumblebee, but like most things some are rare or have restricted ranges and are not commonly seen. The most commonly encountered species are Bombus lucorum, Bombus terrestris, Bombus Pascuorum, Bombus Hortorum, Bombus Jonellus. Depending on your location you may also see Bombus Muscorum. Bombus lapidarius is more common in the south of the country and is listed as vulnerable in the Irish bee Red List. The three species we will be discussing in this post are B. pascuorum, B. muscorum and B. lapidarius. 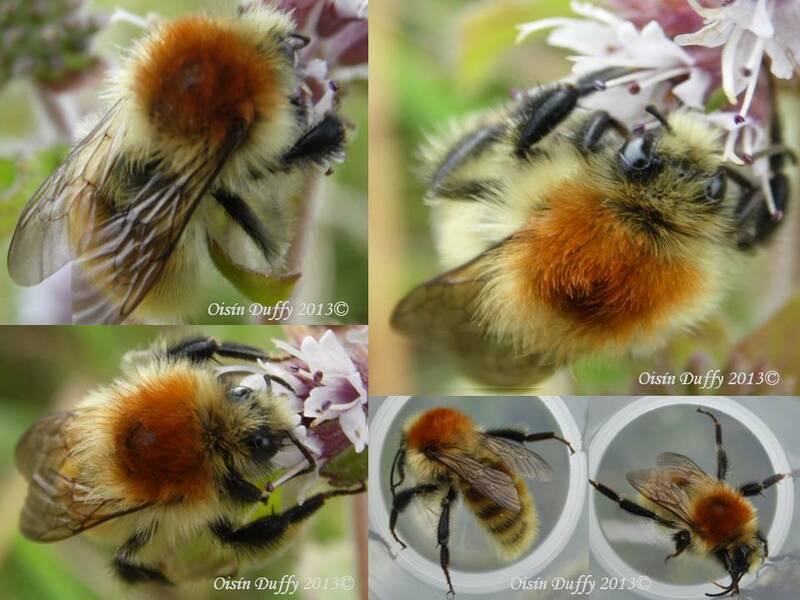 B. pascuorum (also known as the common carder bee) is Ireland’s most commonly seen bumblebee species and is found across a wide range of habitats, including hedgerows, grasslands, meadows and even gardens. The species has a distinctive ginger thorax, which is flanked by white hairs, both brown and black hairs are found on the abdomen. B. pascuroum – Notice the ginger thorax, surrounded by the white hairs. Dark hairs are also present on the abdomen. B. muscorum (also known as the large carder bee) is found in large open, flower rich habitats, generally found in sand dune systems. Both B. muscorum and B. pascuorum have a ginger coloured thorax and this can sometimes cause confusion when trying to identify individuals. B. muscorum has blond hairs flanking its thorax, which distinguishes it from the white flanked thorax of B. pascuroum. The colour of the hairs flanking the thorax in B. muscorum gives the species a very blond appearance. This species has a “Near Threatened” conservation status in Ireland. B. lapidarius (also known as the red tailed bumblebee) is a species which is more common in the southern half of the country and appears to have a more limited distribution in the north (floral rich meadows and dune systems). This species is very distinctive, its tail is red in colour (this can often look orange) with an entirely black body. 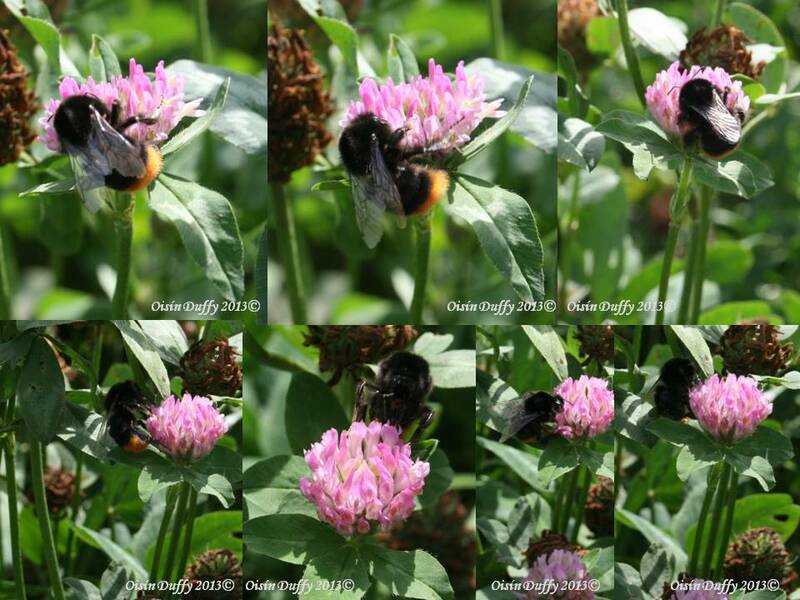 The workers of this species are not easily confused with any other common species of bumblebee in Ireland. (It is however confused with some rarer species in Ireland). This species has a “Near Threatened” conservation status in Ireland. B. lapidarius – Notice how this species is completely black except for a red tail. The hairs on the legs of this species are also black. Another species B. ruderarius is very similar to B. lapidarius except it has red leg hairs.